As we saw last time, the 1975 Ontario Heritage Act made no provision for the protection of provincially owned heritage property. Bilateral agreements had been struck between the culture ministry and a few of the main property-owning ministries and, later, the Crown agency that was created to manage much of the government’s property — the Ontario Realty Corporation. But these arrangements were limited in their scope and certainly in their clout. Meanwhile, back in the policy shop, there was a big push to respond quickly to the new interest from the minister’s office. Old proposals for changes to the Act were dusted off and given a re-think. Most held up, but some — like what to do about the protection of the Crown’s heritage property — not so much. As usual in this situation, one looks to what other jurisdictions do. Most other provinces, with a more centralized approach to heritage than Ontario’s, had legislation that was binding on the Crown and included provincial heritage designation. This meant that provincially owned property could be designated by the province, which in turn meant, in most cases, the minister responsible for heritage. Seems logical, but how had this worked out? Not so well. There were designations of Crown heritage property but they were relatively few, and were usually the result of negotiation between government ministries/departments. This latter point makes sense when you think of it. Following this approach one minister (the culture minister) is essentially designating another minister’s property! The tension — and potential resistance — in the situation is obvious. Throw in that in most provinces, as in Ontario, the culture minister is likely not a cabinet heavyweight. Maybe not the best way to go. What about the feds? They have a Federal Heritage Buildings Review Office (FHBRO). This seems a stronger and more comprehensive model, with federal departments’ responsibility for their heritage backed up by a Treasury Board policy. But it is also a centralized one, with the designation of heritage property by the Minister of the Environment and FHBRO undertaking heritage evaluations as well as other work. The regime also does not apply to federal Crown corporations. Some good things here, but the right fit for Ontario? In addition to researching how other jurisdictions deal with your particular policy issue, it’s equally important to look at how your own deals with different but analogous issues (even if sometimes the parallel is not apparent). Ontario as it turned out had one very recent major initiative that influenced the final policy outcome here: the Ontarians with Disabilities Act, which became law in late 2001. The key take-aways from this legislation were that it applied government-wide, it mandated guidelines to be followed, and it was mainly self-implementing, i.e. not needing a central “review” office. So… on the question of how to protect Crown-owned heritage property what was developed was a proposal for legislative authority to develop standards and guidelines to apply to all ministries and to other “public bodies” as well. To avoid overlap and ensure clarity as to which protection regime applied, property of these owners would not be subject to designation under Parts IV and V.
Easier said than done. But, thanks in no small measure to their shared minister, David Tsubouchi, the “little” Ministry of Culture was able to get the “big” Management Board Secretariat and Ontario Realty Corporation on side. 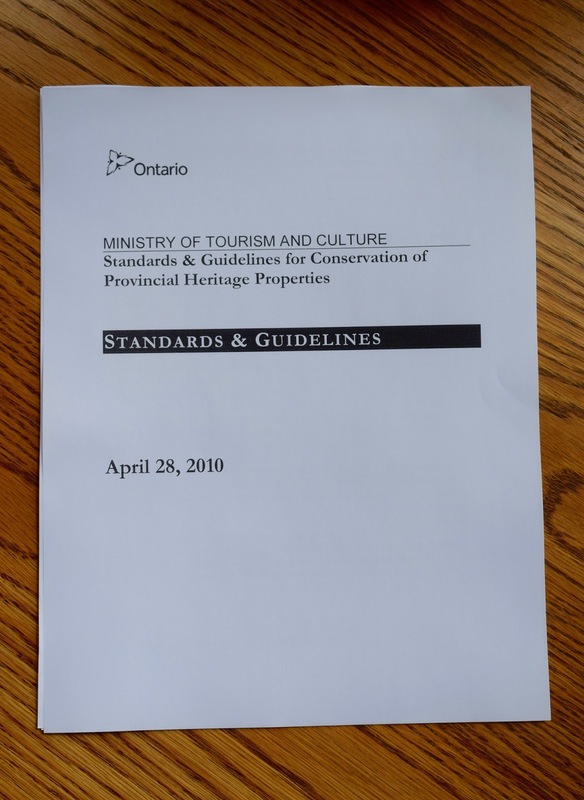 The bill to amend the Ontario Heritage Act introduced in 2003 included a whole new part of the Act: Part III.1, “Standards and Guidelines for Provincial Heritage Properties.” While that bill died when the October 2003 election was called, a virtually identical provision was part of the new government’s Bill 60 and became law in 2005. While this was a huge accomplishment, there were still the small matters of actually developing the standards and guidelines in consultation with affected ministries, getting them approved by cabinet, and deciding on what public bodies they would apply to. This long and difficult process (a story in itself) took another five years! Next time: something cool about Ontario Place! Ontario Place — a special place... and case!